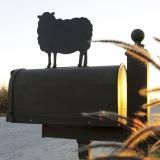 Turn a mailbox into a statement piece with these eye-catching, high-quality mailbox toppers. 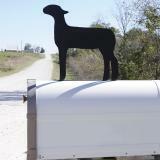 Attaches easily to your mailbox with two bolts (not included). We recommend coating each bolt with a small amount of silicone sealant. Approximate size: L 8.25" x W 1" x H 12"
Located near Kentucky’s Lake Cumberland, in the heart of Civil War country, hundreds of metal silhouettes are cut each week using skilled hands and a plasma cutter. Combining modern technology and traditional craftsmanship, each piece is designed, cut and painted by a single set of hands. Gerald Crowe admits the world of metal art is challenging—but also very rewarding. He enjoys creating functional, usable products by turning his clients’ vision into something tangible. Depending on complexity, each item may take mere minutes to create or upwards of 10 hours. For 8 years Gerald has designed, cut and painted to this rhythm. 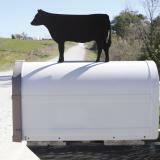 In addition to his metal art, Gerald also raises corn and hay, tends to a flock of over 100 sheep, and travels Kentucky shearing alpacas, goats, llamas and sheep herds each spring. 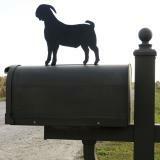 We bought the meat goat mailbox topper. 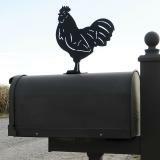 This is perfect for our mailbox. We are primarily goat farmers and it fits the farm image. It should last quite awhile. Thanks for a great product. I love it! 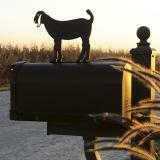 I put two on my entrance gate to my goat farm. I get compliments from everyone! I attached with hose clamps since I didn't want to drill holes in my gate but that worked perfectly. Right size and very distinctive. 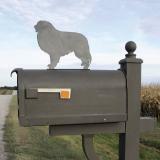 Pros: Well-made, strong powdercoat, good workmanship, decent likeness. 1) The largest fastener size that can be accommodated by the holes is 10-24, which is barely sufficient to keep from pulling through the metal of the box in a high wind. I wound up drilling out the holes to 1/4", AND using fender washers inside the mailbox. 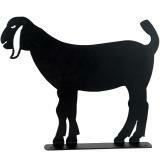 2) The inclusion of a 'mouth' on the goat's head gives it an unusual look. Yes, I know Nubians are traditionally more 'vocal' than most other breeds, but do you have to reinforce it with a mouth that makes it look like it never shuts up?! :) Try leaving the mouth off. Oh, and add a nice udder, that way we know it's 'very dairy'.